After my articles about autumn and winter in Luxembourg, here comes a new 'Spring in Luxembourg'-edition. Spring is always a very exciting season for photography. After months of dull weather and mostly cold and lifeless landscapes and cityscapes, nature is finally coming back to life. The Sun shines more vigorously again, the grass looks greener, flowers pop up everywhere and the trees are in full bloom. Spring is the season where everything is renewed and every spring I spent in Luxembourg, I tried to capture the city from a different and new angle. Two years ago during spring I remember playing around with an old Canon EOS 300. This is an analog camera, so not quite up to the detail and precision of today's digital cameras. But pictures made on film remain something special. I might not shoot film anymore nowadays, but I still have my Canon EOS 300 among other analog cameras. I might bring them out again some day. Anyways, I mostly used the Canon EOS 300 to capture street scenes, but I also made my picture Defying Winter of some early crocuses that had appeared on place Guillaume II, also known as the Knuedler. The resulting picture was raw, noisy and colour-intensive; and I love it. 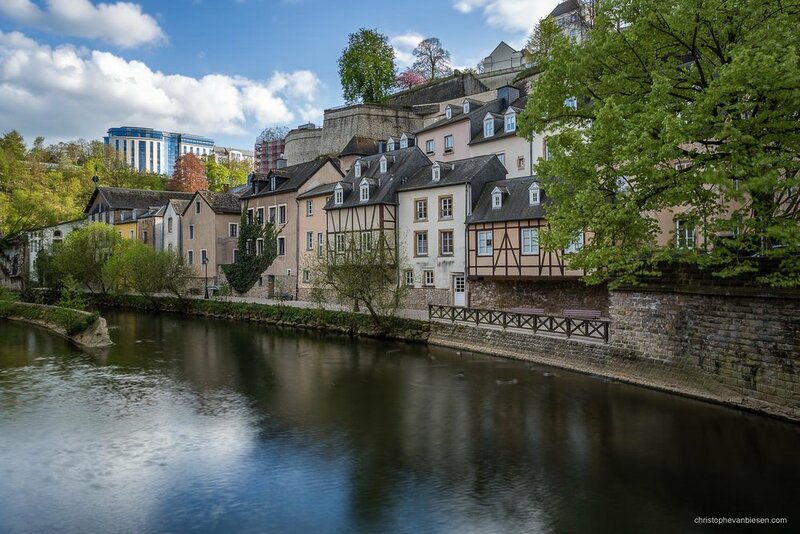 In the background, connaisseurs will recognise Luxembourg's City Hall. 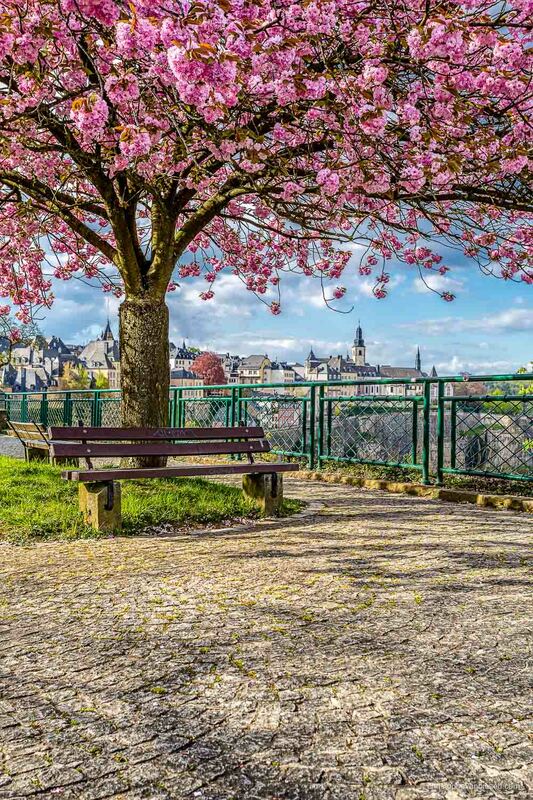 During spring 2014 I concentrated my efforts on capturing the blooming trees in the city of Luxembourg. The vivid purple and pink colours against the blue sky and the bright city allowed me to create some very unique shots. This time around, I wanted the city to be more recognisable in my spring pictures; so I looked for compositions that would allow me to capture famous landmarks and the blooming trees in one single frame. Among the landmarks that I managed to include into those compositions were Luxembourg's Notre-Dame Cathedral in my picture A Bloom with a View, as well as the Saint Michael's Church and the skyscrapers of the European Union on the Kirchberg Plateau in my picture Cherry on Top. I also created a portrait version of the latter picture which I named Pink Canopy and which was published on the cover of the March 2015 edition of Luxembourg real estate iSquare magazine. For 2015 I have new plans which I already set into motion. I have already made a first batch of pictures concentrating once more on the early crocuses in Luxembourg's Edmund Klein Municipal Park. I wanted to create some wider shots this time around and use the sunlight breaking through the trees. My picture Nature Awakens is probably my favourite of this new series. I have also been exploring the city to find some new spots with blossoming trees. Unfortunately, some of the most beautiful trees stand in some of the worst places. There is just no good way to put them inside the frame and create a decent picture. 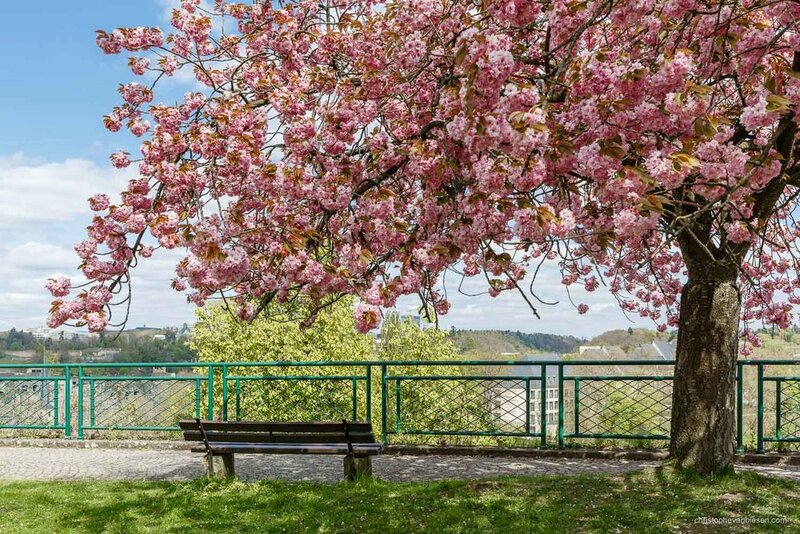 Thankfully, a few blooming trees in the Petrusse valley stand just in the right place to photograph them together with one of Luxembourg's most famous landmarks: the tower of the Banque et Caisse d'Epargne de l'Etat. The resulting picture is the one on the left, City Reborn. Capturing the Sun and its flare is risky business. Very often, the flare won't look good and it takes a few tries and tricks to get the right shots in order to create the final picture. I also found a few trees along the Pfaffenthal that stood just in the right place to capture them together with one of the small watchtowers. In my picture Pink Tide the purple branches make me think of waves that come crashing against the walls of the ancient fortress. The watchtower stands out like a lighthouse. In the background you can see the red Pont du château of the ancient Bock Fortress through which you can walk while visiting Luxembourg's Casemates. Spring is of course even more beautiful outside the confines of the city. Luxembourg's countryside is vast (at least for such a small country) and there is no shortage of opportunities to make spring pictures. Blue skies, flowers and rainbows are all part of that magical spring season. I hope you enjoyed this article. Thanks for reading.